The Air Force Test Center at Edwards Air Force Base leads the Air Force’s test and evaluation mission, conducting developmental T&E and evaluation of air, space and cyber systems to provide timely, objective and accurate information to decision makers. AFTC has oversight of work carried out at three primary locations across Air Force Materiel Command. Organizations include the 96th Test Wing at Eglin AFB, Fla.; the 412th Test Wing at Edwards, and the Arnold Engineering Development Complex at Arnold AFB, Tenn. The 412th Test Wing plans, conducts, analyzes and reports on all flight and ground testing of aircraft, weapons systems, software and components as well as modeling and simulation for the U.S. Air Force. n September 2018, Teichert announced a 116-day Innovation Blitz to further harness the energy and creativity of the wing’s personnel. It is the role of the 412th Test Wing to test tomorrow’s technology today,” he said in announcing the Innovation Blitz. “We do so to shape America’s arsenal for the warfighter. As testers, innovation is in our blood. It is a key part of our history and a fundamental characteristic of the hallowed ground on which we walk. More than ever, America needs us to unleash our creativity to solve our nation’s strategic problems. In January 2019, wing leadership announced that the 116-Day Innovation Blitz was complete, and “it’s time for the next leg of Team Edwards’ innovation journey. There are three core components for the Edwards’ mission: flying operations, maintenance and engineering. Risk is an accepted component of flight testing, but because of Edwards’ benchmark flight test safety processes, the center maintains a stellar safety record. The AFTC’s mission focuses on Developmental Test and Evaluation which is the process used to identify risks that need to be reduced or eliminated before fielding new systems. Once DT&E is accomplished, aircraft systems transition to Initial Operational Test and Evaluation, or IOT&E where the aircraft is evaluated for combat effectiveness and suitability for an intended mission. The 412th Test Wing is the host wing for Edwards AFB — the second largest base in the Air Force. The wing oversees base day-to-day operations and provides support for more than 10,000 military, federal civilian and contract personnel assigned to a 470-square mile installation. Approximately 1,500 Test Wing personnel directly support the test and evaluation mission of the Air Force Test Center and the 412th Test Wing. 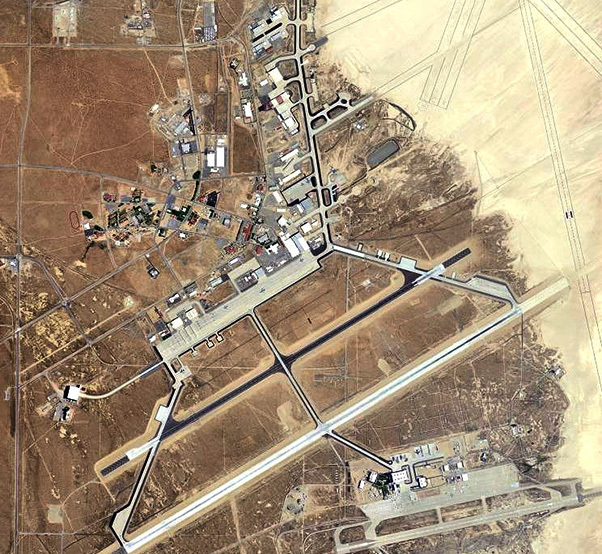 The wing is responsible for operating the base, including the infrastructure, communication systems, security, fire protection, transportation, supply, finance, contracting, legal services, personnel and manpower support, housing, education, chapel and quality of life programs on a 301,000-acre base in the middle of the Mojave Desert. The 412th TW is host to more than 100,000 visitors annually and supports more than 25,000 dependents, retirees and veterans. Major units within the wing include the 412th Mission Support and the 412th Medical Groups, as well the 412th Civil Engineer/Transportation Directorate, 412th Security Forces Squadron and the Services and Comptroller Divisions. Staff agencies include chaplain services, base comptroller, inspector general, manpower and organization, and military equal opportunity and public affairs. The Edwards flightline is the “Center of the Aeronautical Universe.” This is where the future of the nation’s aerospace defense system can be viewed. There are nine flight test squadrons with as many as 20 aircraft assigned to each. The aircraft are grouped by mission representing global power (fighters and bombers); global reach (transport); and global vigilance (unmanned). Ongoing testing includes the F-35 Lightning II fighter aircraft. In November 2018, the Air Force announced that Edwards was chosen to host the B-21’s Combined Test Force.